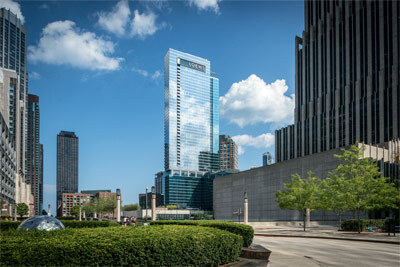 Parking.com is the official self-parking option for Loews Hotel in Chicago. Convenient self-park parking is available to hotel guests and visitors at the Loews Hotel garage. To pre-purchase guaranteed parking, simply click on the "RESERVE" button in the map shown. The Loews Hotel is located in the heart of Chicago – just steps away from the famous Magnificent Mile. The hotel is right off of the Chicago River, and features spectacular skyline views of the Riverwalk, Navy Pier, and downtown Chicago. Also located at the hotel is Rural Society, a contemporary Argentine steakhouse by celebrity chef Jose Garces, and the Spa at Loews Chicago which offers three intimate treatment rooms and an indoor lap pool. Within a short walking distance from the hotel are many popular attractions, including Millennium Park, the Chicago Theatre District, Museum of Contemporary Art, Chicago Water Tower, and John Hancock Center.